Peanut Butter and Jelly sandwiches are a staple in many households. But how do you make them fun? By getting a cookie or sandwich cutter and turning them into a unique shape! Today I made Peyton Dolphin shaped Peanut Butter and Jelly Sandwiches. It’s really easy. Just make the sandwich like you normally would and then take the cookie/sandwich cutter and turn it into a shape. Go light on the jelly because it will spill out if there’s too much. Next up, I had to choose a fruit and since we had that huge container of strawberries in the fridge I decided to put those into the lunch box. Then I looked around to see what was about to expire and I noticed the apple sauce was getting close so in the lunch box it goes! In full disclosure, this was an applesauce pouch. But I wanted to make sure it was still fresh so I squeezed it into the Bento Box. I had two more slots to fill up so I pulled out the trail mix and tossed in a Babybel cheese. 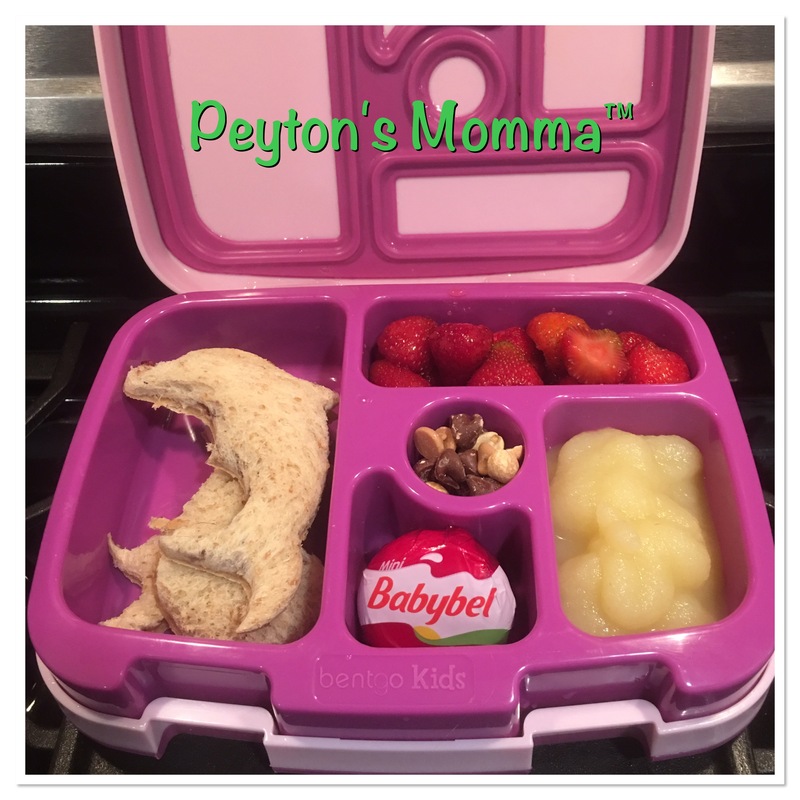 Looking over the Bento Box I feel Peyton has a nice variety of foods to choose from for lunch. And it only takes me a few minutes to pull together each morning. Another fun tip – Head to the dollar store and pick up forks and spoons. You can get a dozen or so per pack and then you won’t have to worry about your child throwing out the silverware. I also like to stop at the party store and pick up napkins on clearance. Peyton never knows what’s going to be on her napkin. It’s always an adventure!